Hunting underwater is a lot different from hunting on dry land. The goals are the same, but the method will differ greatly. Just as you will require special equipment to hunt in the jungle or on the plains, you will need special equipment to be able to hunt under the water. 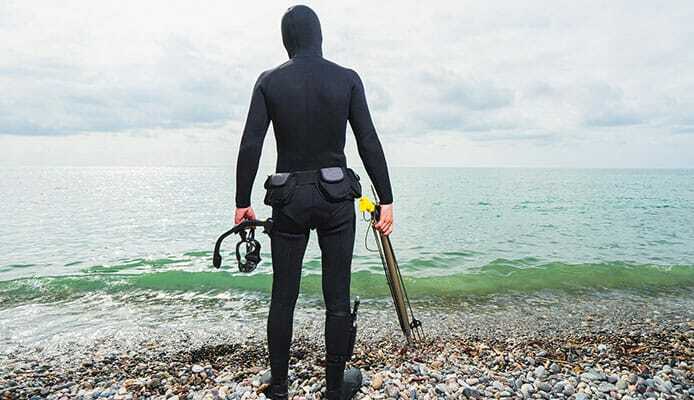 If you are prepared to hunt when you get under the water, then you will find that spearfishing is an exhilarating and exciting sport. The best spearguns will be easy to use, and fun to wield. Using a high-quality speargun will be like using a high-powered rifle on land. Your sole purpose in spearfishing is to catch fish, and a speargun will do just that. A succulent piece of grilled fish for dinner will make you feel like royalty, but biting into a fish which you have caught yourself will make you feel like a king. 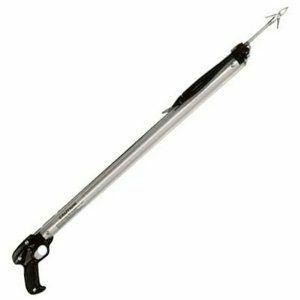 Choosing the best speargun should be fun and easy. The hard work should be saved for when you are in the water. We have compiled everything you need to know to get started with spearguns and spearfishing. Here are our top 10 spearguns in 2018. This Cressi option is a strong and durable design in a lightweight body. A 1.57” diameter barrel gives you the ability to use many different kinds of spears while achieving maximum velocity. Coming in four different sizes you have the choice of size depending on what you are going to be hunting. Cressi uses a pneumatic piston in this gun that propels the spear at a higher speed and gives you ultimate accuracy. A soft handle gives you the grip you need while underwater and can be adjusted according to the size of your hand. The trigger is sensitive so it won’t alter your shot when you have the perfect shot lined up. This is an excellent speargun for the money. This gun has excellent firing precision meaning that you are sure to get your kill every time. An angled hand grip combined with the anatomical muzzle for shaft alignment makes this gun an excellent choice for all skill levels. A gentle shaft release system as well as the easy reload is so easy that even a beginner can do it. With the high quality materials used to construct this gun, it is built to be a perfect option for the most experienced hunters. 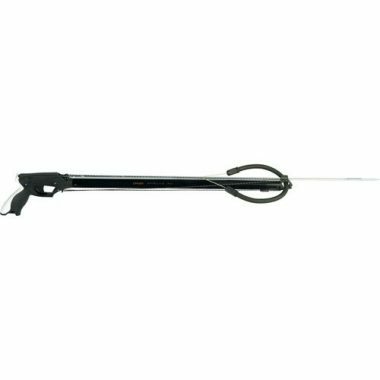 The AB Biller speargun will have you covered no matter what you are trying to catch. Coming in seven different sizes ranging from 24” to 60” you will always be able to snag your catch. The wood shaft gives this a beautiful look while the 3 layers of polyurethane ensure it stands up to the salty environment of the ocean. This gun will shoot straight and accurate and a dual sling will ensure it stays on your shoulder while you get in position. A 6 mm tip will allow you to change it out for a different one that suits you best. This is one of the best speargun for beginners on the market today. This gun will take you from the beginning steps all the way through to when you master the skills. 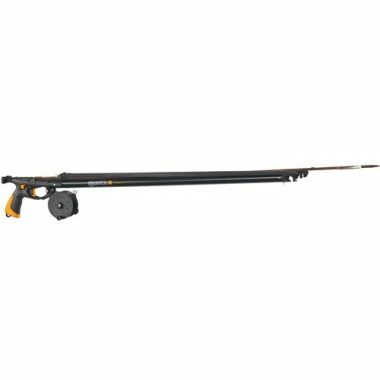 Compatible with a reel, this speargun is powerful enough to catch big fish. 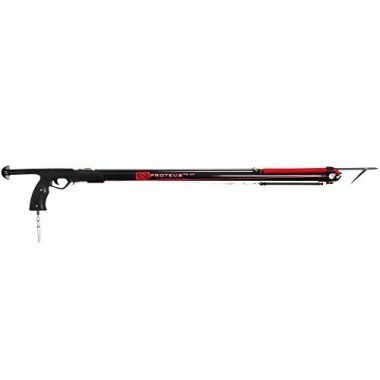 Spearfishing gun reviews are raving over the value you get in this beginner gun. This gun is easy to use and even easier to reload. The Mares Sten is one of the top spearfishing guns on the market. A rigid grip gives you the confidence you need to shoot this gun knowing it won’t slip out of your hand. The 8 mm shaft allows you to use a large range of spears that will snag you the best catch. A safety mechanism will ensure you only fire this gun when you are ready and the trigger is ultimately reliable. The shock absorbing technology makes this gun perfect for fisherman of any skill level. A high capacity air tank gives you the most shots possible before you need to change it out. The double barbed tip will make sure your prey don’t get away before you reach it. Also, the 42 cm gun comes with a leg holster that frees your hands while you’re getting ready. This is one of the best valued spearguns on our list. The JBL D7 is a full featured gun that includes two bands and a high performance spear. Instead of a pneumatic shooter this gun features a double band system that shoots spears at an incredible rate. Featuring a UV protective exterior allows you to use this gun longer. This gun is so solid you are sure to bring home plenty of fish. 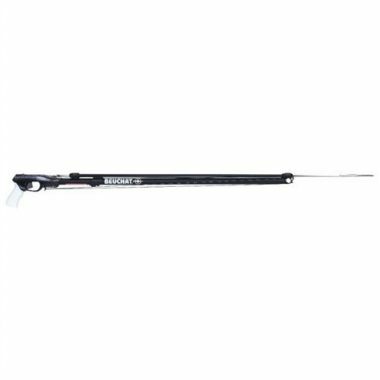 A low profile muzzle makes this speargun perfect for lightweight and compact performance. The stainless steel trigger gives it a pleasing traditional look while the automatic line release makes it easier to use than ever before. This gun is great for those just learning to hunt underwaters. Built to last this speargun is reliable and secure and will take you through years to come. 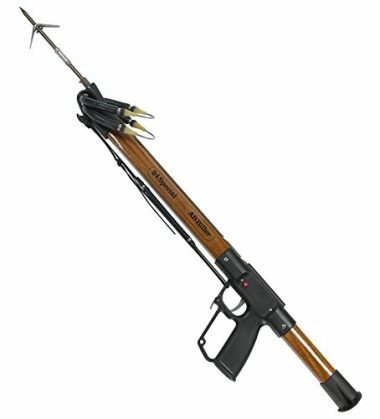 This is the best speargun for the money as you will gain excellent precision, power and durability. This easy to use gun is great for large game fish. Its superior rigidity and it being easy to manage make it an excellent choice for both beginners and experienced hunters alike. You can customize your gun by adjusting the distance between the trigger and the handle as well as adjusting the trigger sensitivity. This gives you ultimate control to get a gun that is perfectly comfortable for you. Mares is so sure you will love this gun they have added a two year warranty to it to sweeten the deal. Be confident in your purchase knowing that you have a reliable gun that excels in precision and durability. A high grip handle makes this gun easy and comfortable to use. The bright yellow grip makes you visible in the water increasing your safety. Be able to hunt better with this quiet gun. 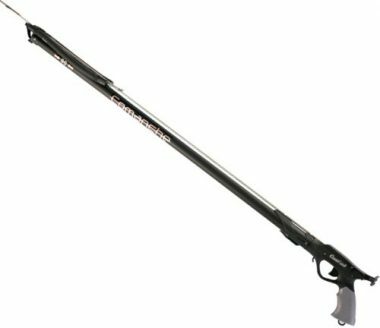 Regular maintenance is a small price to pay for this high quality durable speargun. This gun is designed to handle even strong and powerful fish. Maintaining this solid speargun is easy which will make you want to use it even more. 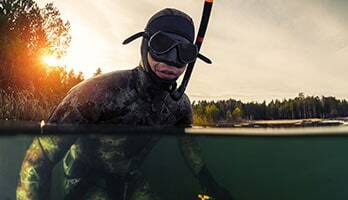 When taking your hunting to the underwater world, you will need some gear to get you started. The most important thing you need is a speargun. When choosing your speargun, consider the following. For starters you should determine the type of fishing you plan to do. Will you catch your fish with deep scuba dive or stay closer to the surface with a free dive? Guns that have less power and have a smaller range is better for free dives where you are in shallow waters or reef fishing. This is better for beginners as it is much easier and requires less accuracy. Alternatively, if you plan to hunt larger game fish you require a larger and stronger spear with a longer range. This requires you to scuba dive and is best for those with more experience as much more skill is required. 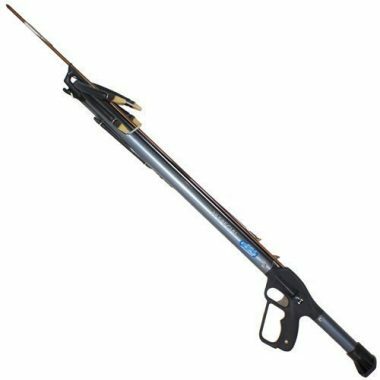 It is important to get a strong and large speargun that will quickly kill your fish as to not prolong suffering and ensure it does not swim away. The most obvious consideration, there are two types spear guns on the market, band and pneumatic. This spear gun is the original, tried and tested over many years and remains the most popular choice. These quiet guns keep you stealth underwater however they do require more maintenance. 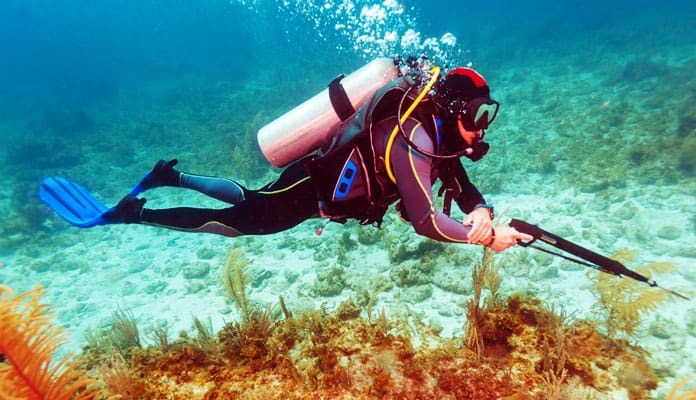 This type of spear fishing gun uses compressed air to fire the spear making it much more compact to dive with. This small spear gun may be easy to carry along for your drive however it is often more difficult to load. The length of your spear gun limits the size of fish that you kill. However comfort and skill level should also be an important consideration. Beginners will often go towards a smaller spear as it is easier to control and far easier to learn off of. A shorter spear is also better for swimming in tighter areas such as caves. A longer spear however is more preferred by experienced hunters and those hunting larger gamefish. The shaft refers to the actual spear that is fired from your gun. These vary widely between manufacturers but there are three main types. This is the heaviest spear shaft and are most used on large fish. This features a single barb and are typically the fastest shaft on the market. These are ideal for reef fish. The same as the single flopper but has two barbs on either side of the shaft. This is best suited for larger species of fish. Speargun reviews agree that this is of the most important considerations to which gun is best for you. Spearguns range in price ranging from $100 – $500. When starting out, it is best to go with a compact basic speargun meant for short range. For those who have experience and the ability to accurately use a speargun we recommend opting for a more high powered speargun. For starters you should determine the type of fishing you plan to do. Will you catch your fish with deep scuba dive or stay closer to the surface with a free dive? Guns that have less power and have a smaller range is better for free dives where you are in shallow waters or reef fishing. This is better for beginners as it is much easier and requires less accuracy. Alternatively, if you plan to hunt larger game fish, then you require a larger and stronger spear with a longer range. This requires you to scuba dive and is best for those with more experience as much more skill is required. 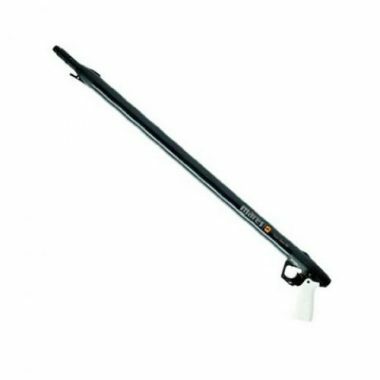 It is important to get a strong and large speargun that will quickly kill your fish as to not prolong suffering and ensure it does not swim away. There are two main types of speargun on the market. Band spearguns and pneumatic spearguns dominate today’s market, though there are others out there. When you are starting out, we recommend choosing from one of these two designs before you branch out into more specialized designs. Band spearguns are the most popular choice. They are powerful and accurate. This makes them ideal form budding spearfishers. Band-powered guns are basically powered by a band of elastic-type material which is pulled back and then released. The band fires the spear through the water. One thing we like about this type of speargun is that you can add to the power very easily. All you have to do is add more bands to the gun. They are also great for beginners as they require minimal maintenance. The only downsides are that band guns need more time to load, especially if you have multiple bands on the gun. The shafts used are also thinner than with a pneumatic gun, meaning that the shafts can bend when they are fired into larger fish. Pneumatic guns are not as popular as they once were, but they are still used by spearfishers around the world. The guns are easy to use, but the strength of the diver will dictate the strength of the gun. They do not have much recoil, and they can be fire with power and accuracy. They are usually compact and reliable, but, due to the large cylinder which fires the spear, it can be hard to get accuracy with the gun at long distances. The length of your spear gun will limit the size of fish that you can kill. The species of fish you are hunting will help you to choose the length of your spear. You should also consider the visibility in the area which you will hunt. Short guns are better for caves and other tight areas. Long guns are better for open water when you cannot get too close to the fish which you are hunting. Comfort and skill level will also play a part in your choice. Beginners will often go towards a smaller spear as it is easier to control learn with. A shorter spear also makes it easier to swim in tighter areas such as caves. A longer spear is preferred by experienced hunters and those hunting larger gamefish. Shafts come in a variety of sizes. The most common shafts range from 6-9mm and are manufactured out of steel (stainless, hardened, and galvanized). Steel is resistant to corrosion and is an ideal material for products which will be used extensively under the water. The most common type of tip for your shaft is the single barb (also known as flopper). This type of tip has a barb milled directly into the shaft. A Hawaiian flopper tip is one where the bar is on the bottom of the shaft, and a Tahitian floppier shaft is one where the barb is milled into the bottom of the shaft. Double flopper tips have barbs on both sides. They hold on to fish better. We always recommend setting a budget before setting out to buy any water sports product. Spearguns are no different. Once you know what you are looking for in a speargun and how much you can afford to spend, you can narrow your choices down. We recommend spending nearer to your upper limit to get a higher quality gun which will last you a lot longer. A better speargun will also be easier to use and will help you to catch more fish. Q: Is A Speargun Safe To Use? A: If the user is careful, then they are completely safe. If the user is not careful, then they can cause serious harm and even death. You need to remember that you are wielding a weapon. Once you have loaded the speargun and pressed the trigger, there is no going back. You should always take the time to ensure you are being safe, and always think before you fire the gun. Never point a speargun at anything unless you are willing and able to shoot it. Be careful that you do not fire the gun at any rocks. You should also be careful that you do not fire the gun at creatures such as a stingray or electric eel or you risk injury. A speargun is a weapon, and you should treat it with respect. Make sure to inspect your gun regularly, and take care of it. Always ensure that your mask is on correctly. Clean your gun when you need to, and replace parts when they break. Follow the instructions when you are loading the gun, and follow the instructions when you are firing the gun. If you take the time to use the gun as it is intended, you will never put yourself or anyone else in danger. Q: How Much Does A Speargun Cost? A: Just like guns you would use to hunt game, or anything else, there are a variety of prices which you can pay. The price you do pay will depend on what you get with your gun. We would recommend anything between 50-100 dollars as a good starting gun. We never recommend opting for a cheap gun to start out with as it will usually make it harder for you to hunt. You want to invest in something with high-quality materials. You also want a gun which has been crafted to be accurate and powerful. By investing a little more money, you will get a gun which will last and improve your time under the water. Q: Do I Need Special Training Before Using A Speargun? A: No. There is no need to be specially trained before using a speargun and there is no need to get an official license to use it. Having said that, we would recommend having some training before you use a speargun for the first time. If you contact your local dive club, they will be able to train you in using a speargun or put you in touch with someone who can train you. Shooting a speargun under the water is a lot different from shooting a gun on land. You do not have your foot planted on the ground, so you need to practice a little to get your aim right. There is a lot more to think about when you are under the water. Hunting underwater can take a little getting used to, but part of the fun is the journey. 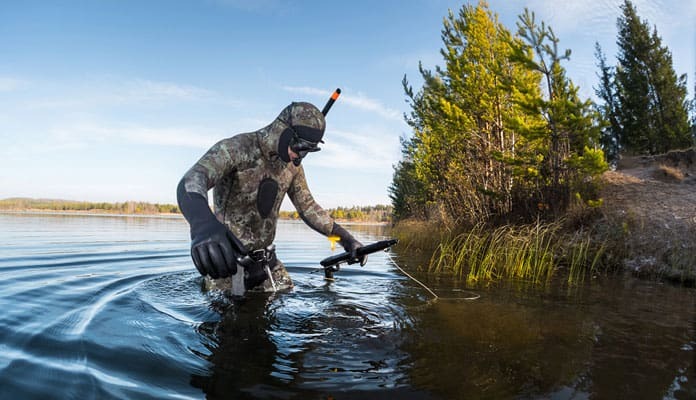 At their core, spearguns are easy to use and do not have many moving parts, however, there is still a lot to think about before you go out and buy a speargun. We have compiled all of the information you need so that you do not need to waste your time searching. When you have all the information you need, you can choose one of the guns from our list. We have something for everyone, and we are sure that we have the gun for you. It does not matter if you are spearing a fish for the very first time or you are spearing your thousandth fish, the thrill is always there. There is something primal about catching your own food. It tastes better when you have cooked it up. For the best experience, take a BBQ with you and cook up your fish as soon as you catch it. Do you have a speargun on our list? Let us know how you like it in the comment section below.